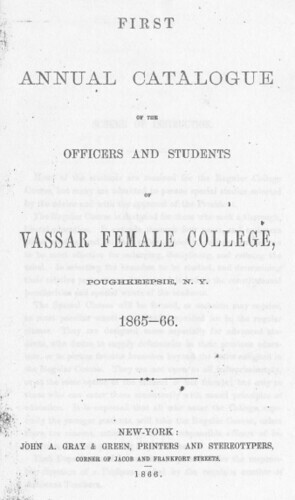 When Vassar College opened in 1865, it faced a number of challenges. The question of curriculum posed a very basic and immediate problem. Matthew Vassar had decided to found a college for women equivalent to colleges intended for men, but it was initially somewhat unclear what form this equivalence would assume. The original course catalogue reveals these curricular uncertainties. A quick study of the entrance requirements exposes the struggle to define a qualified applicant when its prospective students did not come from a standardized school system. In the mid-nineteenth century, there were relatively few preparatory schools for women in the United States, so parents often chose to teach their daughters at home. Even the girls who attended school had encountered a wide variety of educational programs. Some schools taught needlework instead of mathematics, or comportment instead of Latin, leaving applicants with large gaps in their education. Even with the course catalogue's somewhat vague entrance requirements, many women who arrived in the fall of 1865 were unable to meet standards. Thus, the catalogue was forced to attempt to describe a curriculum that provided a collegiate education for women who for the most part were inadequately prepared for it. The original and current course catalogues would seem to have little in common. Prodigious flexibility marks Vassar's current curriculum; in comparison, the original course catalogue seems excessively rigid and limited. While the absence of classes addressing politics, race, or gender is expected, the gap remains striking in light of courses available now. Other elements are even more surprising: to a modern student, the School of Art and Music is entirely unfamiliar and the emphasis on physical education is arbitrary. Essentially, on first examination Vassar's first catalogue seems to contain little more than a slightly ridiculous and unnecessary set of restrictions. It is less difficult to see how unusual some of the classes that Vassar offered were at the time. In the nineteenth century, women did not formally study Latin, Greek, biology, and mathematics at any advanced level. Most nineteenth century educators would have found the fact that the college required most of these subjects through senior year either progressive or dangerous, depending on their personal affiliations. The similarity between the original and current course catalogues therefore lies in their allegiance to innovative and forward-looking educational programs. The differences between the two curricula almost constitute a textbook demonstration of the evolving nature of the word "progressive": both push radically at their contemporary educational boundaries. When Matthew Vassar decided to build a women's college, he embraced the idea of change: a comparative study of the old and new course catalogues demonstrates that over the years, Vassar College has succeeded at fulfilling his goal admirably.